Philip Sidney Burgess was born in Portsmouth in August 1922. Both his parents died when he was very young, so at the age of four he and his brother were adopted by the Rowland family in Folkestone, Kent. 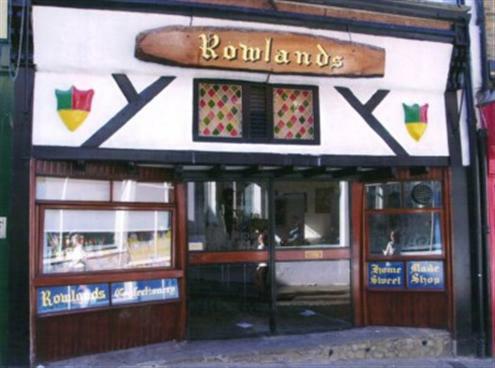 The Rowlands were well known in the town as they ran a popular rock and sweet shop. Burgess was educated at the town’s Harvey Grammar School. 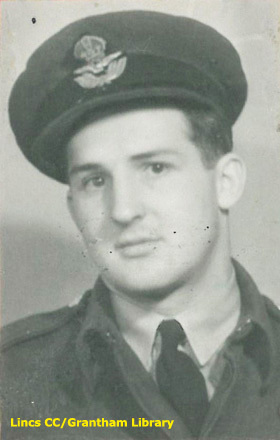 He volunteered for the RAF soon after his 18th birthday, and undertook part of his training in Canada. He was commissioned in May 1942, and after further training was promoted to Flying Officer shortly before being posted to 61 Squadron in January 1943, a few months after he turned 20. He then became the regular navigator on a crew captained by the New Zealander Ian Woodward, in which the wireless operator was Charlie Williams. By the end of March he had completed 17 operations. However, his captain Ian Woodward had completed his tour so both he and Williams agreed to join the crew being put together by Norman Barlow which would transfer to 617 Squadron for the planned secret mission. Despite the six weeks of low level training, Norman Barlow, Philip Burgess and the rest of the crew were all killed instantly when they hit a pylon just outside Haldern, Germany. Yet to turn 21, Philip Burgess was probably the youngest officer to take part in the Dams Raid. He was buried with his comrades in Dusseldorf Cemetery, and reinterred after the war in Reichswald Forest Cemetery. His brother, Carrol Burgess, served in the Royal Engineers and survived the war. Thanks to Susan Paxton and Alan Wells for help with the entries for all the Barlow crew. I think the 37 operations he was credited with have to be wrong; I’m suspecting 17 might be the correct number. He joined 61 Squadron in late January, and if we can use Charlie Williams’ logbook for February as an example, he might have been getting 9-10 ops a month, so Feb-March he might have had 17 when he followed Williams to 617. Hopefully the family still have Phil’s logbook and we might be able to pin this down. Hi, my family name is Burgess and originated from Lydd, many family members are buried in Lydd churchyard, I stopped by there the other day and noticed Philips memorial, my grandad was named Tom, I wonder if we are related? It would be lovely to find out. Gloria, was your grandfather named Carroll Thomas Burgess? If so, he was Philip’s brother. Hi, thanks for that info, just need to check with the family. I am the Secretary of the alumni orghnaisation of The Harvey Grammar School, Folkestone, UK, which Philip Burgess attended as a pupil. On 6th december 2014, at our annual reunion, we will be unveiling a special memorial to Phil. We would love to hear from any family members and would make them most welcome. Phil, several of Philips’s relatives are in contact on this site and a few others with me. If you could leave your email address or phone number so they could get more information, that would be great. It’s Jenny (Rowland) from the ski centre! Just got a list of Philip’s ops with the Woodward crew in 61 Squadron; he flew 13 ops with them total, one an RTE, starting with Hamburg on 30 January and ending with Munich on 9 March. Probably had a couple more as a supernumerary after Woodward finished, but haven’t chased those down yet. My name is Phyllis Frost (nee Burgess). Philip was my dad Ernest Burgess cousin. I am doing the Burgess Family Tree and was wondering if you could help me out with any information on the Rowland family and after Philips parents death how they come to adopt him. I know they had the rock and sweet shop in Folkstone but nothing else about them.Also any information ,Photos etc. We should all be thankful for the sense of duty and service these brave men had in defending this country. On 7th May of this year (2015) we celebrate VE day which commemorates our victory over a German attempt to create a single European State. Some say it is a coincidence that the day also falls on election day. We shall remember those who died to keep us free. Thank you Phil. Clive Rowland Hickman (Phil Burgess was my step-uncle adopted by my grandfather Raymond Rowland). Hi Clive, I was wondering if you could give me more information on how Philip came to be adopted by your Grandfather and at what age. When Philip was enrolled at Harvey Grammar School he was enrolled by his aunt Gertrude Lewis nee Burgess. I would love to hear any information you have about Philip. He was my second cousin. Regards Phyllis Frost nee Burgess.